Over 30 Tucson graphic designers attended our free Spectrum Signature Seminar, "Fiesta del Fuego: Hot techniques to spice up your designs" on August 14, 2013. ¡"Viva la fiesta! Last week Spectrum Printing Company hosted a special presentation for local Tucson graphic designers by HP Digital Press Expert, Ron Sarne, from San Francisco. Presentation topics focused on advanced design techniques, unique features of the HP Indigo Digital Press, short-run quantities, personalized designs using variable content data, specialty boxes and packaging, and the mailing requirements involved when using these special techniques. Sarne is the Business Development Manager of Hewlett Packard's Graphic Solutions Business. He is a key element in HP’s initiative to provide mission-critical business solutions to develop Digital Marketing Programs. With expertise in digital print and targeted marketing, Sarne works closely with print providers to better understand and leverage the values of "1-to-1 Marketing," web-enabled print and integrated campaigns. With over 18 years of experience in the print and digital imaging industry, he has been involved in all aspects of the sales, marketing and business development processes in the industries of graphic communication, Internet/software development and IT consulting services. Based in San Francisco’s Bay Area, Sarne has a degree in graphic communication from California Polytechnic State University (Cal Poly) in San Luis Obispo, where he is on the advisory board and also guest lectures. Spectrum's Production and Mailing Experts - Our Production Manager, Ken Huizenga, and Mail Division Manager, Lee Oliverio, were on hand for a valuable Q&A session. With over 27 years of experience making sure Spectrum client projects get the best in quality, efficiency, and on-time deliver of products, Huizenga is a trained operator and maintenance technician, and trains all new operators to ensure client projects are handled with care and consistency. Serving as the liaison between clients and the USPS, Oliverio is Spectrum’s resident mailing specialist, certified by the United States Postal Service making sure clients' mail pieces are designed for maximum mailstream efficiency and cost effectiveness, and that it is processed and delivered to the post office in a timely manner. Kari Fry from Mohawk Paper in California was also present at the seminar, showcasing sample dimensional Mohawk paper and specialty boxes printed by Spectrum. 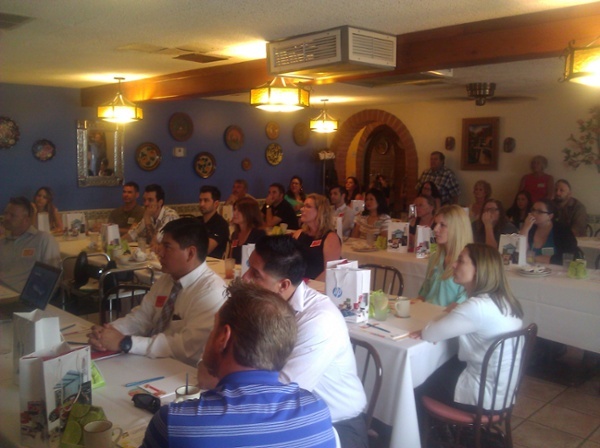 Seminar participants also enjoyed a Mexican-style breakfast buffet by one of Tucson's favorite Mexican restaurants, Molina's Midway. How are your graphic designs taking advantage of what the HP Indigo Digital Press can offer you? We'd love the opportunity to brainstorm ideas on the methods that will help you deliver results. CONTACT US at Spectrum Printing Company: (520) 571-1114. Consider the Possibilities.